Hey! Let’s Write a WebExtension! | Blog-O! Hey! Let’s Write a WebExtension! 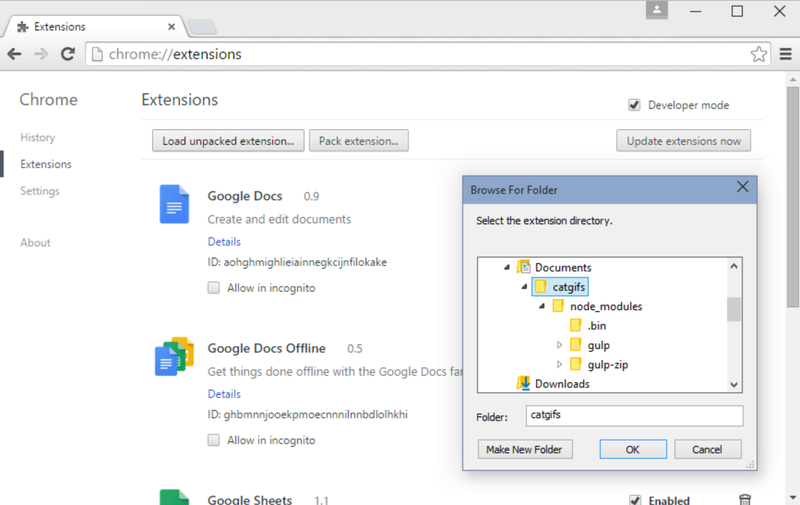 WebExtensions are a new way to write Firefox extensions. The technology is developed for cross-browser compatibility: to a large extent the API is compatible with the extension API supported by Google Chrome and Opera. Extensions written for these browsers will in most cases run in Firefox with just a few changes. The API is also fully compatible with multiprocess Firefox. The only thing I would add is that while Mozilla is implementing most of the API that Chrome and Opera support, we’re not restricting ourselves to only that API. Where it makes sense, we will be adding new functionality and talking with other browser makers about implementing it as well. 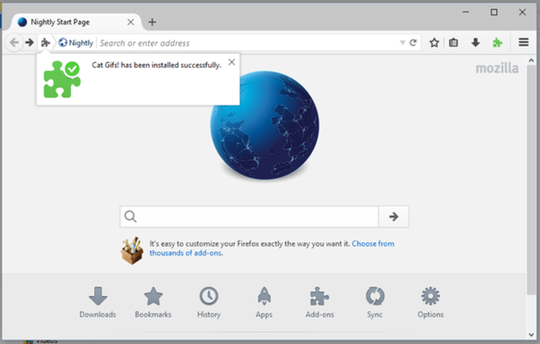 Finally, since the WebExtension API is still under development, it’s probably best if you use Firefox Nightly for this tutorial, so that you get the most up-to-date, standards-compliant behaviour. But keep in mind, this is still experimental technology — things might break! Okay, let’s start with a reasonably simple add-on. We’ll add a button, and when you click it, it will open up one of my favourite sites in a new tab. The first file we’ll need is a manifest.json, to tell Firefox about our add-on. Great! We’re done! Hopefully your code looks a little like this. Of course, we have no idea if it works yet, so let’s install it in Firefox (we’re using Firefox Nightly for the latest implementation). You could try to drag the manifest.json, or the whole directory, onto Firefox, but that really won’t give you what you want. 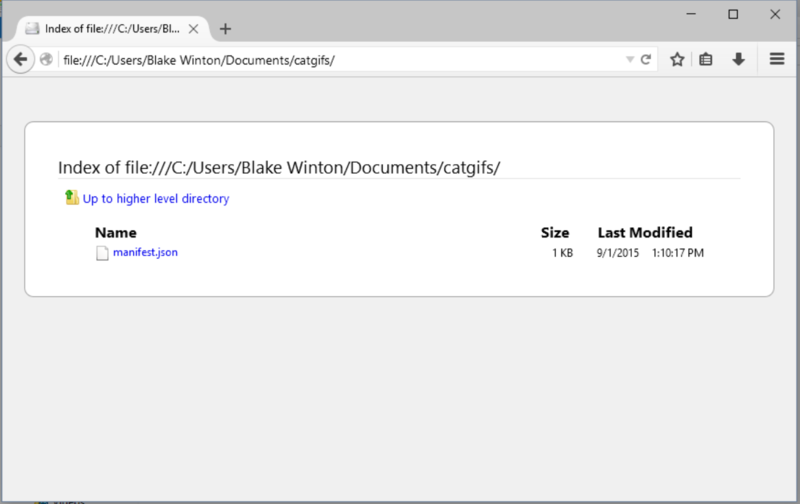 To make Firefox recognize your extension as an add-on, you need to give it a zip file which ends in .xpi, so let’s make one of those by first installing 7-Zip, and then typing 7z a catgifs.xpi manifest.json. (If you’re on Mac or Linux, the zip command should be built-in, so just type zip catgifs.xpi manifest.json.) Then you can drag the catgifs.xpi onto Firefox, and it will show you an error because our extension is unsigned. We can work around this by going to about:config, typing xpinstall.signatures.required in the search box, double-clicking the entry to set it to false, and then closing that tab. After that, when we drop catgifs.xpi onto Firefox, we get the option to install our new add-on! It’s important to note that as of Firefox 44 (later this year), add-ons will require a signature to be installed on Firefox Beta or Release versions of the brower, so even if you set the preference described above, you will soon still need to be running Firefox Nightly or Developer Edition to follow this tutorial. Of course, our add-on doesn’t do a whole lot yet. So now that we have gulp installed, we should make a file named gulpfile.js to tell it how to build our add-on. 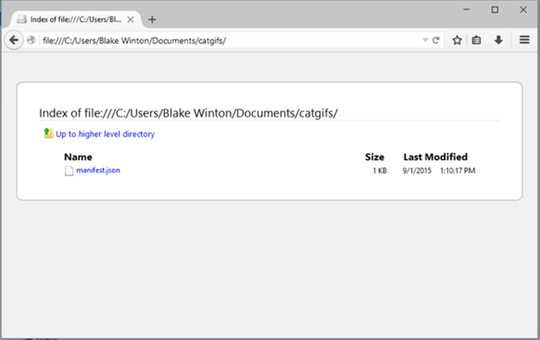 Once your gulpfile.js looks like this, when we run it, it will create the catgifs.xpi (as we can tell by looking at the timestamp, or by deleting it and seeing it get re-created). Now, if you’re like me, you clicked the button a whole bunch of times, to test it out and make sure it’s working, and you might have ended up with a lot of tabs. While this will ensure you remain extra-chill, it would probably be nicer to only have one tab, either creating it, or switching to it if it exists, when we click the button. So let’s go ahead and add that. // There is no catgif tab! make sure it looks like this, rebuild, re-install, and shazam, it works! Well, it works, but it’s not really pretty. Let’s do a couple of things to fix that a bit. And, of course, we’ll need to download a pretty picture for our icon, so let’s save a copy of this picture as icon.png, and this one as icon128.png. and save this image as button.png, and this image as button38.png. Well, there is another thing we could try to do. I mean, we have an add-on that works beautifully in Firefox, but one of the advantages of the new WebExtension API is that you can run the same add-on (or an add-on with minimal changes) on both Firefox and Chrome. So let’s see what it will take to get this running in both browsers! 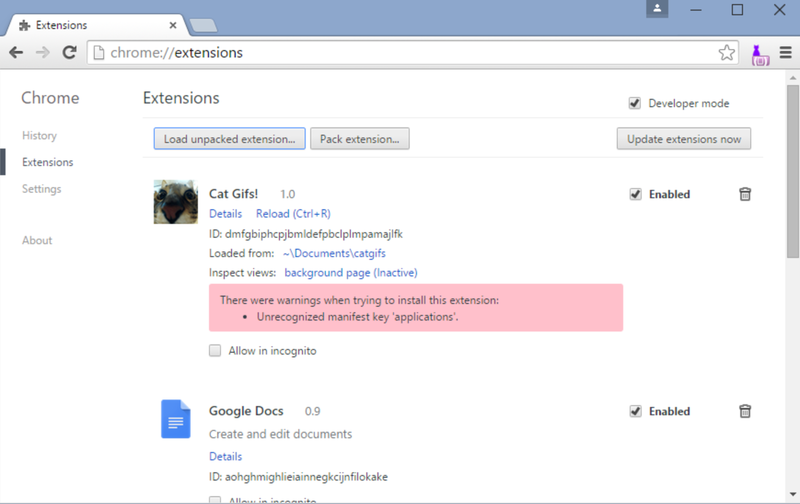 Then we can click the “Load unpacked extension…” button, and choose our directory to load our add-on! Uh-oh, it looks like we’ve got an error. Finally, if you have any questions, or run into any problems following this tutorial, please feel free to leave a comment below, or get in touch with me through email or on twitter! If you have issues or constructive feedback developing WebExtensions, the team will be listening on the Discourse forum.